Have you been ghosted lately? Don’t laugh… if you’re a PR agency or other service business, chances are it has happened to you. I don’t mean that thing where a friend or dating partner suddenly stops returning all texts or calls. I’m talking about business or “corporate ghosting,” which can be just as infuriating and perplexing as its social equivalent. 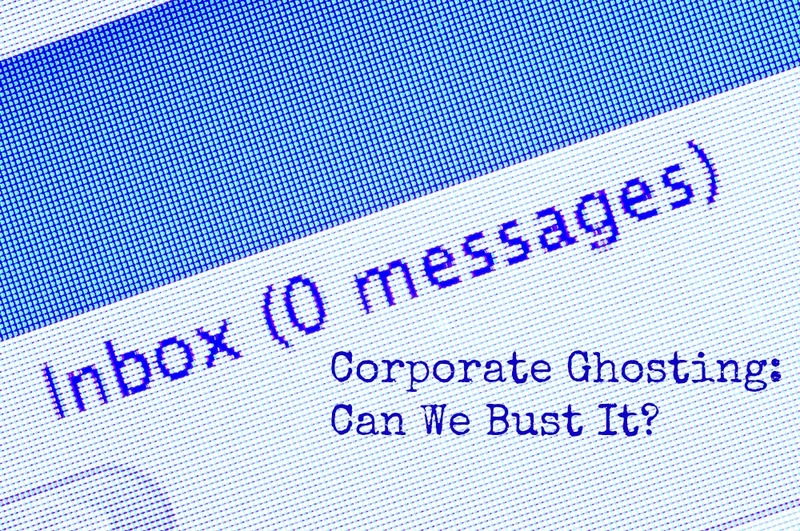 As outlined in a post by Sharon Jones, corporate ghosting seems to be on the rise. In fact, colleagues and I have been talking about it for years; we just never gave it the name. But the ubiquity of email and our frenzied and blurry workstyle seems to have made it more acute, and even more acceptable. Maybe you’ve been there. I recently swapped business ghosting stories with Richard Laermer, who sent me Sharon’s post, but we can all identify. You meet or talk with a prospective client to learn about his organization’s needs and goals. You research his category and competitors, spend hours or days on a customized proposal, and review it at a meeting that seems to go well. In most cases you expect to hear back within a week or two. You send a nice follow-up note, maybe with an extra observation about the meeting. And then — nothing. Crickets. You send a reminder email, then another. Maybe you give a phone call. Still nothing. It wouldn’t be so annoying if corporate ghosting were ultra-rare, but it seems to happen more today than in years past. Sometimes I throw up my hands, and on a few occasions I’ve actually stopped following up for fear of losing my temper and being snarky. My associate Marijane has a better attitude; it’s a grim, ghostbusting determination to get an answer. She is absolutely dogged in running down ghosters, and we usually do get a response – most frequently a vague email couched in apologies. I’ve had a few memorable ghostings of my own over the years, and I’ve grouped the ultimate responses of note into categories, Nancy Drew-style. The riddle of the new boss. Several ghostings have involved a sudden change in senior management, requiring the agency decision process to be delayed or to simply fade away. This is understandable, although I’m surprised that it happens when the change was planned, like that Israeli security company that swore to get back to us when its new CMO is on board. It’s been three years, but, hey, it’s a tight market. The case of the vanishing team. This is thankfully rare, because it never bodes well. For a pitch two years ago, we fought our way through three rounds of an agency review, a final presentation to senior management and a tough budget negotiation. At last, we won the assignment. We were asked to send in a draft letter of agreement for legal review. After ten days, my email inquiring about the status of the LOA bounced. So did emails to other team members. After calling around I ultimately got a return call from a junior content manager who explained very politely that the senior team had left suddenly en masse. She confided that she wasn’t sure who her boss was. Sigh. We never did start the engagement, but she and I have stayed in touch. The secret sabbatical. There are apparently lots of long vacations in our business, particularly for lucky communications officers in Western Europe. One woman explained she hadn’t had time to get back to us because she had departed for a sabbatical in the Galapagos Islands. I’m not sure why she planned the agency search just before her trip, but at least it was an answer. I’m still more envious than mad over that one. The puzzle of the lost package. We never heard back from our point of contact at a major blue-chip brand that had requested hard-copy proposals in response to its voluminous RFP. When contacted, a team member told me they had carefully marked up each document with comments on the recommendations in order to send back to the agencies as feedback. But, he explained, they had moved offices and it “must be in a box somewhere.” I’m not kidding. You can also be ghosted by prospective employees. I once offered a young woman a job by telephone. She asked for some time to think it over, and I followed up with the full written offer. But I never heard back, and she didn’t respond to calls or emails. Suffice to say, it probably wouldn’t have been a good fit. I could get bitter about the corporate ghosting thing, except that I’ve occasionally been guilty of it. It’s easy to procrastinate about getting back to someone, and then to let it slide. Once I had to go lawyer-shopping due to litigation over a lease, and it was flattering to have law firms woo me for my business, but awkward to explain my decision to the runners-up. I found myself falling back on the old “chemistry” rationale, which no one ever wants to hear. But reading Sharon’s post has made me vow to do better. Call it karma, or maybe pay-it-forward. If I can be respectful of the time someone puts in to pitch a job, whether an interior designer or an attorney, then maybe we can all get more respect in return. Respect is the operative word! Thanks for calling attention to this ongoing concern. Makes me wonder what others in proposal-driven businesses have to say on the subject.